One of the great summer nebulas, IC1396 and the Elephant Trunk nevertheless deserve substantial exposure time to bring out detail and depth. Here over 10hrs with Epsilon130 and Eos6da were taken, and 22x8min H-Alpha with Sigma 180 Macro and Astrel8300B were mixed in to get better contours and the weaker parts better in definition. By 2x Drizzle the resolution was fitted quite well. 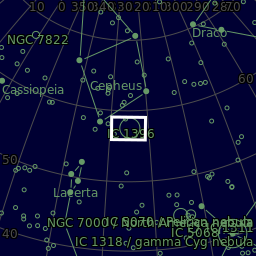 Check out little PN G100.4 +04.6, the little greenish hook to the right of My Cephei the garnet star.